American Insurance Organization recently donated five Dell computers and accompanying monitors, keyboards, mice and cables Dress for Success of Allentown. Dress for Success is an international not-for-profit organization that empowers women to achieve economic independence by providing a network of support, professional attire and the development tools to help women thrive in work and in life. Dress for Success helps women find jobs and remain employed, provides recipients a business outfit for job interviews, and then subsequent outfits after she finds employment. The Allentown, Pennsylvania chapter also recently opened a “Career Center”, where clients can receive services such as resume writing guidance and job application assistance. 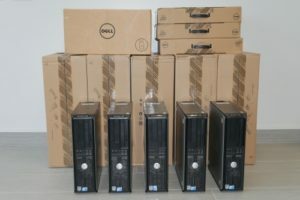 Ideal Concepts’ computer donations will help that office continue their important work within the Lehigh Valley community. Allentown’s Dress for Success has a 75% job retention rate for the past year because of the services it offers. As an international organization, Dress for Success has 147 offices in 24 countries, and has served more than 1 million women worldwide. Business attire and monetary contributions were also donated by Ideal Concepts friends and family for Dress for Success. To find out how you can help, visit www.Allentown.DressForSuccess.org!